Occupational health will increasingly have a role in looking at how workplace health improves or subdues performance, a leading practitioner has predicted. Steve Clark, corporate HR manager, occupational health and safety at Sheffield City Council, has argued that OH is evolving from being simply an ‘illness’ service. 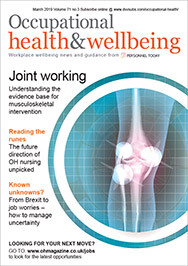 “There will be a move from OH focusing on dealing with the casualties and the ill to working with HR people in terms of what makes people perform and excel,” he told Occupational Health. “It will not be ill-health prevention but people being well, focused and healthy at work,” he added. With a number of organisations, such as Unilever, Bedfordshire police and Standard Life Healthcare, already looking at issues such as nutrition and sleep management in relation to productivity and performance, OH will inevitably have a role to play in this debate in the future, he forecast. “Organisations are starting to look at well-being and health in that complete sense, not just patching people up when they have been damaged,” he said.